My husband used to buy me lilies all the time because he loved the look of them so much. I love them too, but not as cut flowers indoors (they have a stinky smell inside that I don’t like.) I never had the inclination to tell him that they were not my favorite cut flower for fear of hurting his feelings. But I love growing perennials, and this perennial bulb is a favorite of mine. Growing Lilies in your Garden. 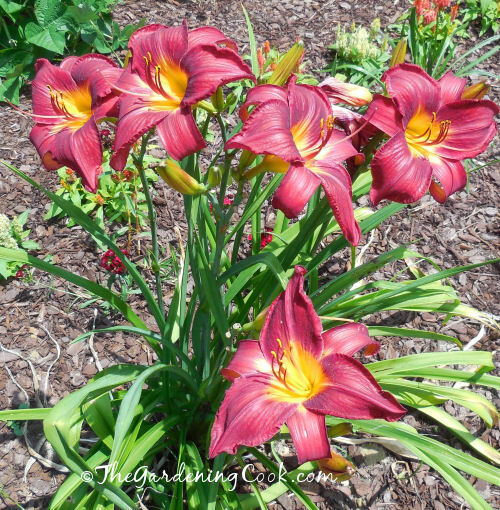 Grab a cup of coffee and enjoy my virtual lily tour. Perhaps it will inspire you to plant some of your own. This was the surprise of the year for me. I got this amaryllis at a Yankee Swap for Christmas a few years ago. I forced it indoors and when it was done, I planted it outside in my test garden. I had zero hopes of it making it through the winter, since I am in zone 7b and amaryllis are tropical and thrive in zones 9-10. Much to my delight, even after a very cold winter with three snow storms, AND a transplanting adventure, it bloomed! 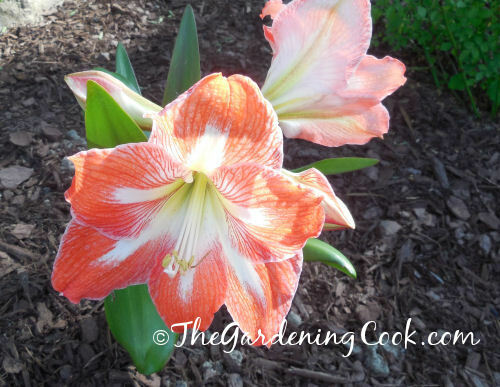 One very hardy amaryllis lily indeed! 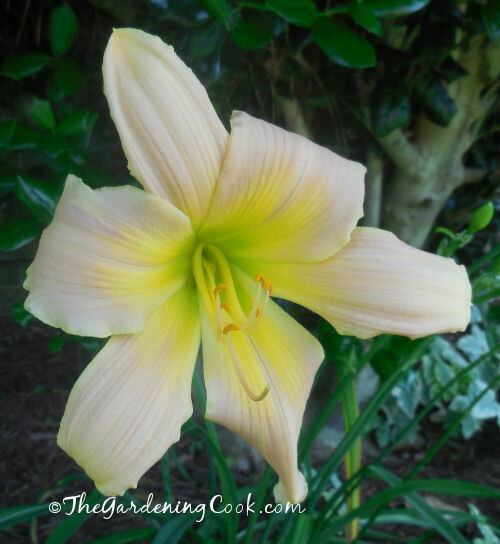 An added bonus – This was the first lily bloomer this year, coming out in very early spring. This double clump of Stella D’Oro Day lilies is located in my front garden. It has naturalized beautifully and gets bigger each year. 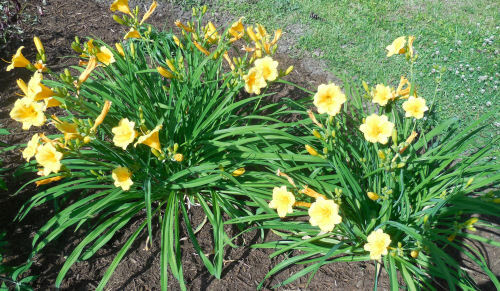 I love these day lilies because they will re bloom. Just remove the spent flowers (which only last one day) stalk and all. They need very little care and mine flower for quite a long time during the summer months. 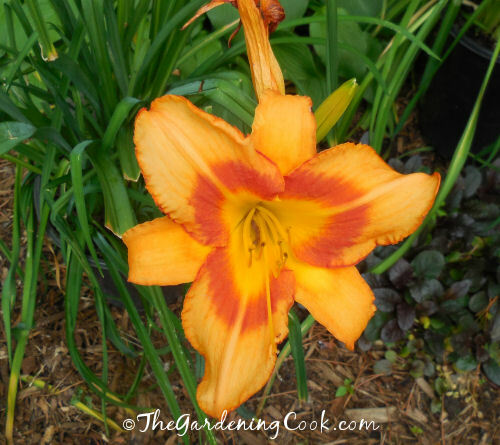 Another reblooming day lily. This one has a yellow and peach flower with light stripes on it. So delicate! 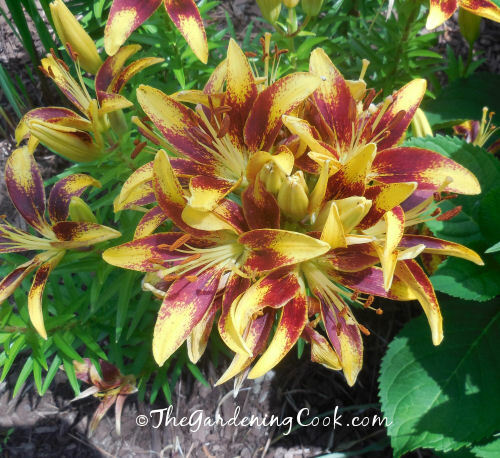 The Asiatic lilies are the first of the very large blooming varieties to flower in my garden. I got a magnificent display during the month of June. This one is in my back garden and was always very upright. It just wanted to greet the sun in a big way. I waited for about two weeks in anticipation of this Asiatic lily plant blooming. It had at least 50 blossoms waiting to open. Mid June gave me this treat of a display. This orange Asiatic variety is new this year. I placed it in my perennial vegetable garden and got very early blooms from it. Such a vibrant color too. 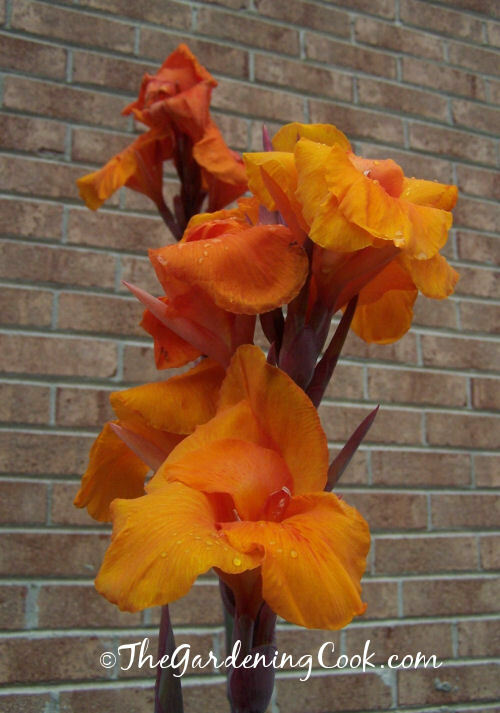 Canna Lilies start flowering the end of June for me and continue through the summer. I also have newly planted yellow ones. They are naturalizing well and have increased in size but are yet to flower. 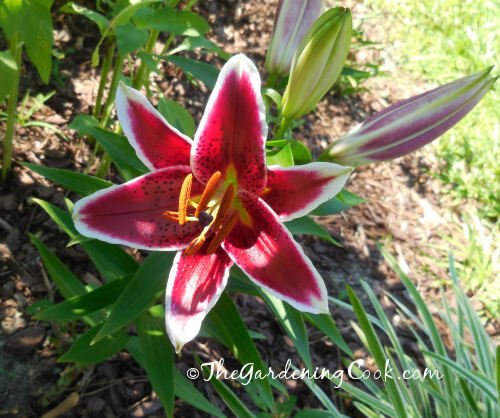 This lovely day lily sits in a fairly shady area of my garden but still flowers beautifully. 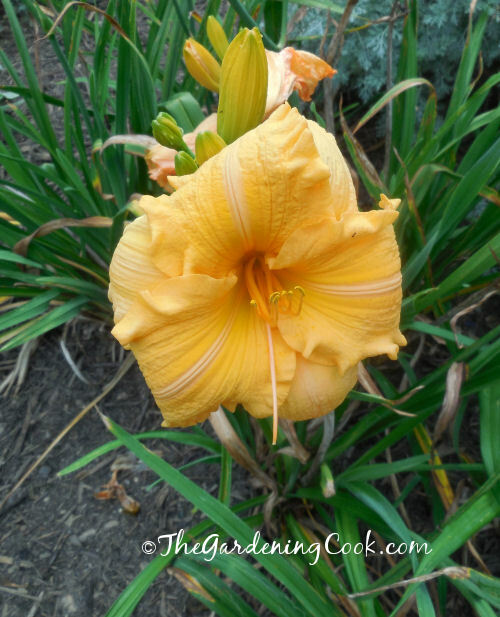 The color is very subdued, a pale peach variety with a bright yellow center. Deep crimson with a bright yellow center. Such a dramatic display of flowers. The bees and hummingbirds love it! 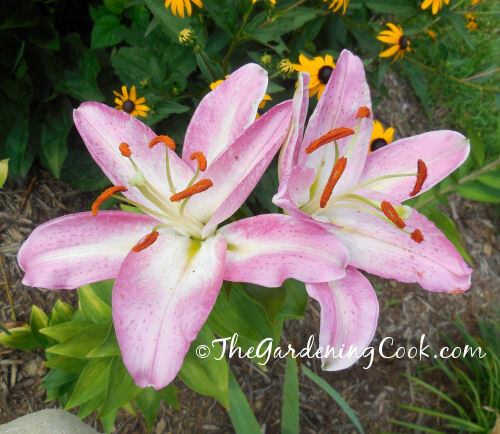 If you love lilies but can’t find them locally, or affiliate Amazom.com has a Great Collection of Lilies for sale. My pride and joy. 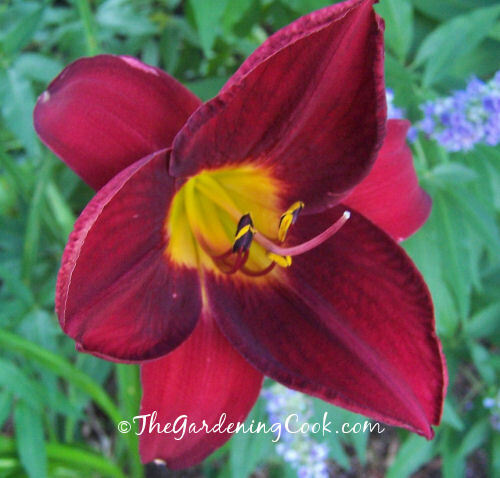 Red Vols Day Lily, winner of the best day lily of 2000 by Better Homes and Gardens. This is so special because it was a gift from another gardening blogger that I have become friends with over the year. It has moved from a shade garden to full sunlight and loves its new location. This is a new addition this year and a nice surprise to boot. I bought it from Lowe’s at half price with one bloom on it. It appeared to be the common Stella D’Oro yellow variety. 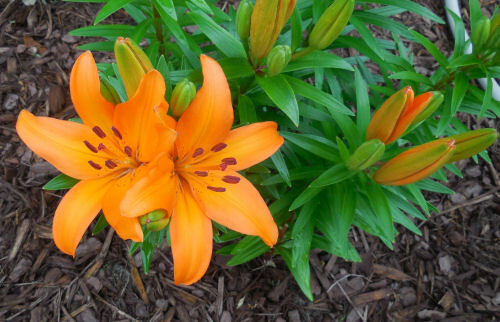 I had planned to plant it near my mail box with some other lilies. To my delight, the last bloom opened to this glorious peach variety with a deep red throat. What a great surprise! Mid July to early August is the time for my Oriental lilies to take front and center stage. These are the type that hubbie used to bring home as cut flowers for me. I love the orange stamens on this variety. They make a great contrast to the pink petals. This pretty Oriental lily sits in what I call my “Jess Garden.” (my daughter and I planted it from scratch before she left for California.) 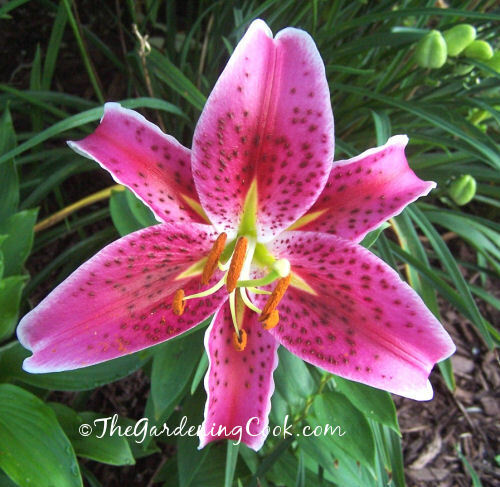 I love the spotted petals of this pink variety. Another Oriental lily in my Jess Garden. This one faces the street. Great contrast of red and white on the petals. 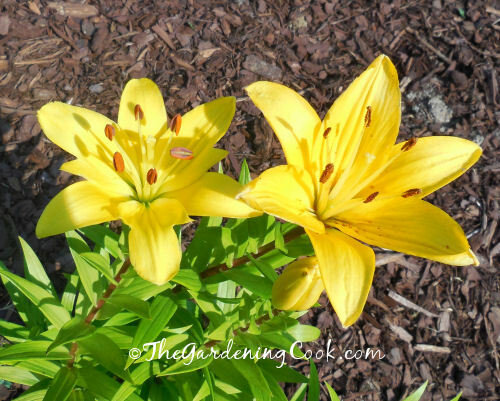 Finishing up my lily tour is another Oriental. 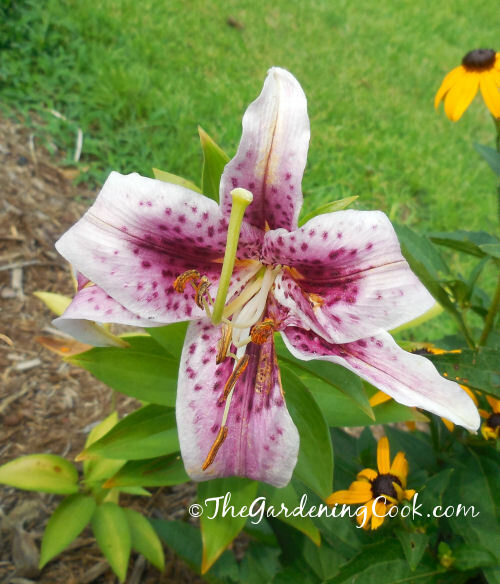 This Star Gazer Oriental Lily sits in the front garden bed and gets sunlight all day long. It is a great contrast to the Black eyed Susan’s that sit nearby. 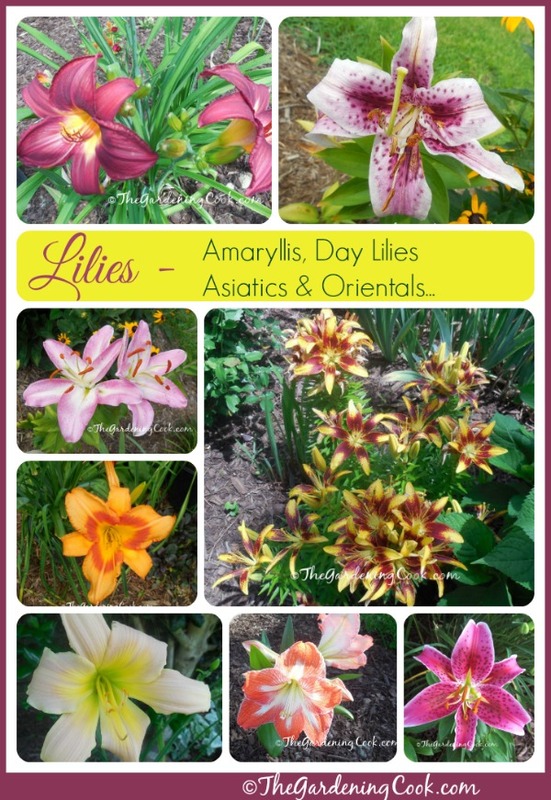 Many of these lilies are available from my affiliate Amazon.com if you cannot find them locally. I hope that you have enjoyed my Lily tour. Do you grow lilies? Which varieties are your favorite? Please leave your thoughts and comments below. Nice pics! I bought three lilies at Lowes on clearance today. Yellow, orange and crimson. Can’t wait to put them in a spot where I can enjoy them while sitting out on my deck. Thanks for sharing your lilies.